Toyota showcases the all-new Corolla Hatchback in a commercial that says “A life well lived comes with a few scratches”. The spot follows a group of friends as they navigate the ups and down of a night out, which include being chased by dogs, arriving at the hospital with a broken arm, drifting with the new Corolla Hatchback in a warehouse, grabbing something to eat from a fast-food restaurant and going to a night club wearing masks. The scratches they have are not a problem though, because there is polish for that, and the memories they create are far more precious. The song used in the ad is the 2018 single “Go Getter” by LA singer-songwriter Mama Haze (Meaghan Maples by her real name), from her debut album, “Honey”. 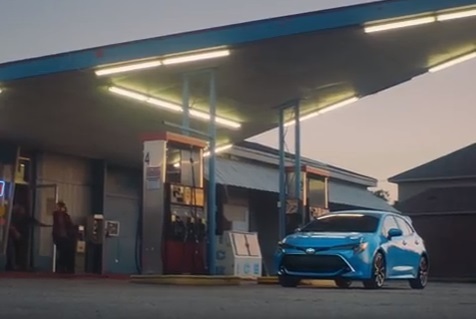 The 2019 Toyota Corolla Hatchback features a 2.0L Dynamic Force Engine, an all-new suspension and Dynamic Shift-CVT, which combines the immediate response of a traditional First gear with the efficiency of a Continously Variable Transmission, 6-speed Intelligent Manual Transmission, an all-new design, which includes unique rear window spoiler, chrome grille surround, LED taillights, LED fog lights, 18-inch alloy wheels, and an interior boasting leather-trimmed sport seats, premium piano-black accents, soft-touch materials and contrast stitching on the dash and doors, and newly enhanced available Remote Connect, which gives you control of the car, all from your Apple Watch or Android smartwatch. The available models include Corolla Hatchback SE, starting at $19,990, and Corolla Hatchback XSE, starting at $22,990. Tinder Social Commercial Song 2016 – What are you doing tonight?